Category Archives for "Smart Home Basics"
Heating and cooling costs make up 50% of the average household energy bill. A few smart home devices can help you take a big chunk out of that. Install the right devices, and you’ll end up with a greener home and a lower monthly energy bill. 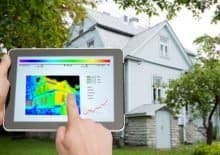 Next, I am going to tell you about four smart home products that can combine to reduce your monthly heating and cooling bill by about 34% and sometimes much more.